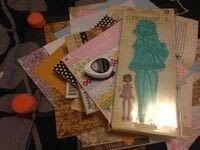 Use a laminator to increase life expectancy of paper dolls! 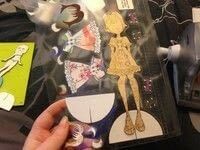 Doll Option 1: Stamp Dolls and various pieces I stamped hair, dresses, and shoes on a variety of papers and cut out the pieces to create the pieces to change on the doll. 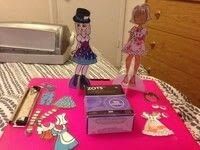 Doll Option 1: To make the dolls more sturdy I glued them to empty Kleenex boxes and cut them out. 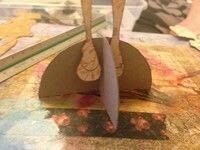 You want to use thin cardboard so it will be able to be laminated. 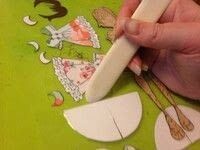 Doll Option 1: Cut the circle in half In the 1st piece cut half way "up" the middle in the 2nd piece cut half way "down" the middle Feel free to color or paint these pieces as desired. 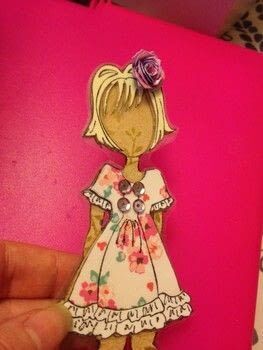 Doll Option 2: Print the dolls on card stock. I used white card stock I found at Walmart. If you chose black and white, color them before cutting out to make it easier. 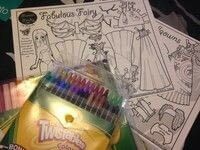 Doll Option 2: When you cut these out cut off the tabs and use a black marker to fill in the lines if needed. 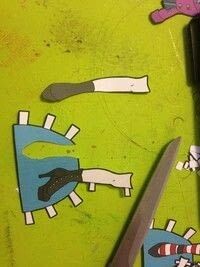 Doll Option 2: For the shoes I just cut out the actual shoes so I could add a doll stand. Make sure any glue or paint is completely dry. 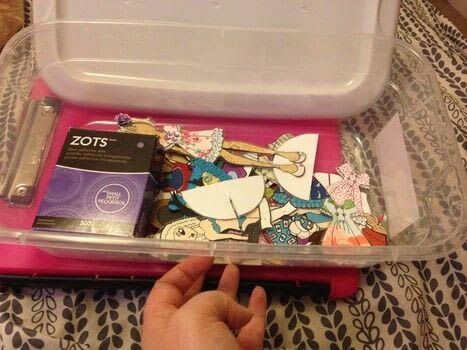 Laminate your pieces being sure to leave space around them to cut them out. 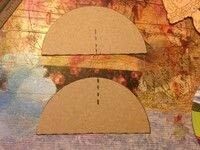 When you laminate there is a "halo" around each piece you want to be sure to cut around that "halo" or the laminate will pop open in that spot. 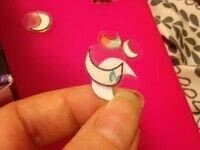 Because this is using a cold laminate the piece of plastic are like a sticker sandwich and you can make the halo smaller by burnishing around each item with a bone folder, popsicle stick, or even just your fingernail. 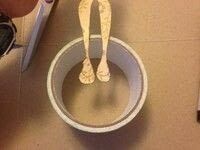 The exception in this project is the doll's stand. 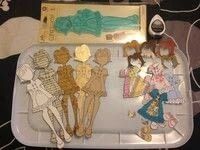 Because the cold laminate is basically a sticker you can cut right up against the project for the bottom of the doll stand and right up into the cut of the doll stand without it coming off (It is no longer protected for water at these areas once cut so no paper doll pool parties!) 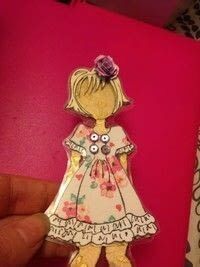 *This will NOT work with thermal (hot) laminate- If you are using hot laminate Don't laminate the stand pieces and attach the doll to the stand After the doll is laminated. From my research Hot Glue and E-6000 work on hot laminate I have not tested it though. 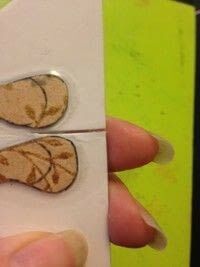 When cutting out the hair you can leave the laminate in the face area to make life easier- since the laminate is clear no one will notice when it's attached! Because of the water-resistant coating on the cold laminate virtually no adhesive will stick to it. 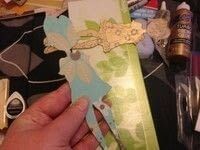 The exception is glue dots- The hold is temporary and will not hold much weight but works just fine for this project! 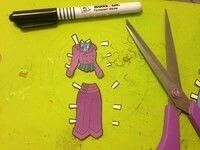 *If you are using hot laminate, as an alternative, you can glue pieces of velcro onto the doll and clothes. 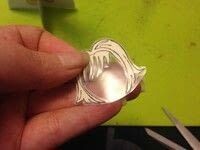 From my research Hot Glue and E-6000 work on hot laminate I have not tested it though. 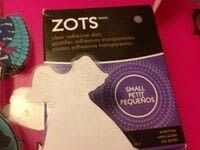 For storage you can leave the glue dots attached and just press two pieces together or cut out circles from your laminate scraps to put of the glue dots.